This set of Cyber Security Quiz focuses on “Cyber Laws and IT laws – 2”. Explanation: Under section 66 of IT Act, 2000 which later came up with a much broader and precise law says that without prior authorization or permission, if any individual access any computer system, it is a cyber-crime. 2. Cracking digital identity of any individual or doing identity theft, comes under __________ of IT Act. Explanation: Under section 66 of IT Act, 2000 which later came up with a much broader and precise law (as IT Act, 2008) says that if any individual steals the identity or misuse any victim’s identity for his/her own profit, it is a cyber-crime. 3. Accessing Wi-Fi dishonestly is a cyber-crime. Explanation: Under section 66 of IT Act, 2000 which later came up with a much broader and precise law (as IT Act, 2008) says that if any individual access anyone’s Wi-Fi network without the permission of the owner or for doing a malicious activity, it is a cyber-crime. Explanation: Download copy, extract data from an open system done fraudulently is treated as according to section 66 of the Indian IT Act. Explanation: Any cyber-crime that comes under section 66 of the Indian IT Act, the person accused of such cyber-crime gets fined of around five lacs rupees. 6. How many years of imprisonment can an accused person face, if he/she comes under any cyber-crime listed in section 66 of the Indian IT Act, 2000? Explanation: Any cyber-crime that comes under section 66 of the Indian IT Act, the person accused of such cyber-crime gets fined of around five lacs rupees and 3 years of imprisonment. 7. Any digital content which any individual creates and is not acceptable to the society, it’s a cyber-crime that comes under _________ of IT Act. Explanation: Any digital content which is either lascivious is not acceptable by the society or viewers or that digital item corrupts the minds of the audience, then the creator of such contents falls under the cyber-crime of section 67 of the Indian IT Act. 8. IT Act 2008 make cyber-crime details more precise where it mentioned if anyone publishes sexually explicit digital content then under ___________ of IT Act, 2008 he/she has to pay a legitimate amount of fine. Explanation: IT Act 2008 make cyber-crime details more precise where it mentioned if anyone publishes sexually explicit digital content then under section 67 – A he/she has to pay a legitimate amount of fine. 9. If anyone publishes sexually explicit type digital content, it will cost that person imprisonment of _________ years. Explanation: IT Act 2008 make cyber-crime details more precise where it mentioned if anyone publishes sexually explicit digital content then under section 67 – A he/she has to pay a legitimate amount of fine and imprisonment of five years. 10. Using spy cameras in malls and shops to capture private parts of any person comes under _______ of IT Act, 2008. Explanation: Using of spy cameras in malls and shops to capture private parts of any person, without the concern of that victim, then it comes under section 67 of IT Act, 2008 as a punishable offense. 11. Using spy cameras in malls and shops to capture private parts of any person comes under section 67 of IT Act, 2008 and is punished with a fine of Rs. 5 Lacs. Explanation: Using of spy cameras in malls and shops to capture private parts of any person, without the concern of that victim, then it comes under section 67 of IT Act, 2008 where the person doing such crime is punished with a fine of Rs. 5 Lacs. Explanation: Using of spy cameras in malls and shops to capture private parts of any person, without the concern of that victim, then it comes under section 67 of IT Act, 2008 where the person doing such crime is punished with imprisonment of 3 years. 13. Misuse of digital signatures for fraudulent purposes comes under __________ of IT Act. Explanation: Cyber-criminals and black hat hackers do one common form of cyber-crime that is a misuse of digital signatures. The law for this fraudulent act comes under section 72 of the Indian IT Act. Explanation: Sending an offensive message, emails o any digital content through an electronic medium to your recipient is a punishable offense that comes under section 66 – A of the Indian IT Act, 2008. 15. Stealing of digital files comes under __________ of the Indian IT Act. Explanation: Stealing of digital files, e-documents from any system or cloud or electronic device is a punishable offense that comes under section 66 – C of the Indian IT Act. 16. Section 79 of the Indian IT Act declares that any 3rd party information or personal data leakage in corporate firms or organizations will be a punishable offense. Explanation: Section 79 of the Indian IT Act covers some of the corporate and business laws circulating technologies and cyberspace; declares that any 3rd party information or personal data leakage in corporate firms or organizations will be a punishable offense. 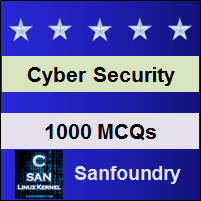 To practice all areas of Cyber Security for Quizzes, here is complete set of 1000+ Multiple Choice Questions and Answers.